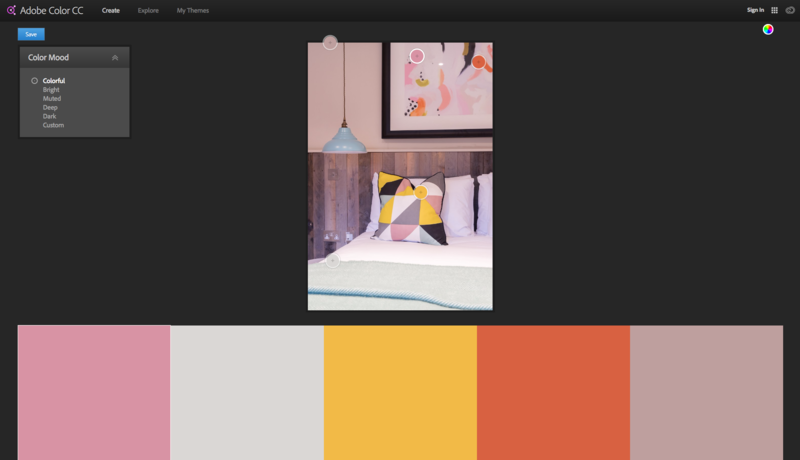 Adobe Color (once known as Kuler) is a free, easy to use tool which can be used to create downloadable colour palettes. 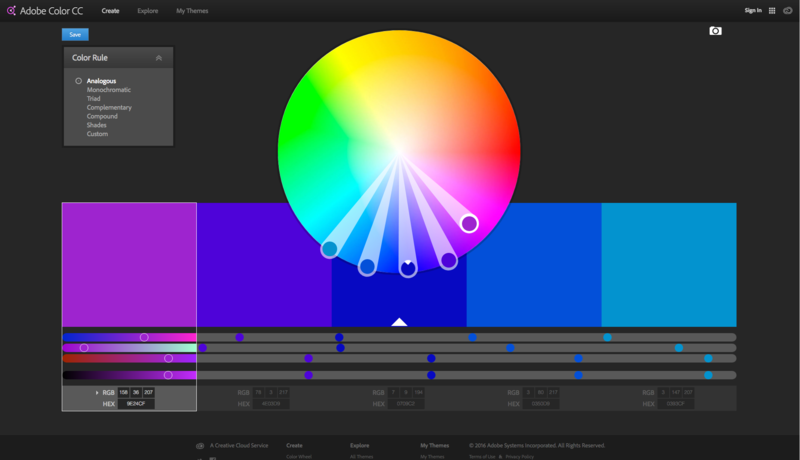 This tool can be very handy if you’re trying to come up with a colour scheme for your brand. If you’re stuck you might find inspiration. Or if you’re simply unsure on which colours will complement each other and work well together Adobe Color can help. When you first visit the Adobe Color website you don’t need to log in or sign up. Therefore, you can have a play around with the colour wheel tool without an account. However, if you create a colour palette that you want to save, you’ll need to create an Adobe ID. With an Adobe ID you can then save your themes to come back to later. When you go to the Adobe Color website you’ll automatically land on the Create tab. This is where you can make your own colour theme. From ‘Colour Rule’ drop-down menu you can choose from a list of rules, each with a different way of matching colours. Next, play around with the colour selectors. Click and drag one of the circles on the colour wheel to find a colour you like. Moving toward the centre of the wheel will make the colour lighter, while moving outwards will turn it a darker shade. The wheel will automatically move the other selectors to find four colours that match the one you’ve chosen. This is a great way to learn which colours complement each other on the colour wheel. To create your own theme that doesn’t automatically match colours on the wheel, choose the ‘Custom’ colour rule. This allows you to pick 5 colours of your own choosing. 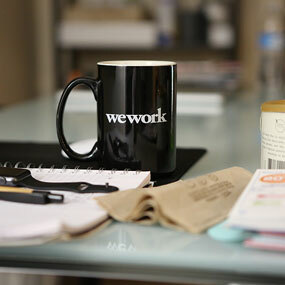 Another great feature of Adobe Color is the photo upload. You can upload any image from your device to the website. The tool will pick 5 colours from this image and create a colour palette. You can customise this palette by choosing a Colour Mood from the menu on the left of the screen. Alternatively you can click and drag the selectors on the image to the colour you’d like. To change the colours more precisely you can click the colour wheel icon on the right hand side. This will take the colour palette to the colour wheel page where you can adjust each of the 5 colours from the image. If you’re looking for inspiration for a colour theme, visit the ‘Explore’ tab. On this page there is a library of colour palettes created and shared by other Kuler users. You can search these palettes to find your favourites. Then either save them as they are and download them to use yourself or you can edit them in the colour wheel. Adobe Color is a great tool for creating colour themes that can be downloaded and used in Photoshop, Indesign or any other Adobe software. Whether you’re only looking for inspiration, or to create a full colour palette, Adobe Color can help you to choose colours for your brand.